Last week was half term but it was no ordinary half term for us here as the kids went away for a few days with their Granny visiting family. Whilst they were away we were busy building a surprise for when they returned. A few months back during a storm their plastic playhouse got broken when a pipe fell from the side of the house crashing through it's roof. So whilst they were away, my Dad, a family friend and I spent two hours out in our back garden in the rain putting their surprise together. The surprise? 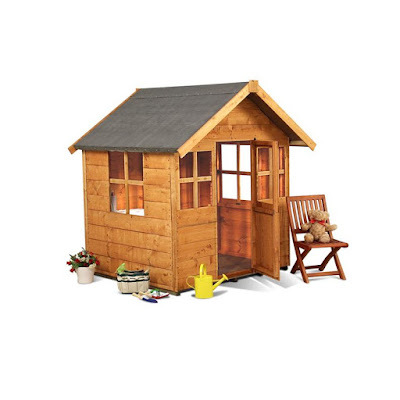 A brand new 4x4 BillyOh Mad Dash 300 Bunny Playhouse from Garden Buildings Direct who are a lovely Nottingham based company. From start to finish the company itself has been so helpful. 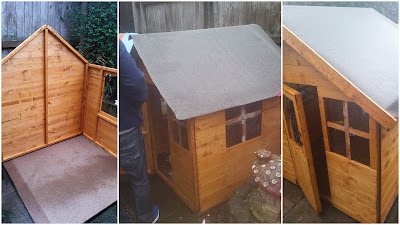 From the friendly delivery drivers who loaded our playhouse into our garden for me, to the the after care phone calls I have received this week checking everything was OK. The Bunny Max Playhouse is the biggest playhouse in their range and features a traditional cottage style look that your little ones will just love and it fits well into any sized garden. Everything comes flat packed so you do need to put it together yourself. It does recommend that a minimum of two adults are required or in our case, three. Everything you need comes included, all the wood, windows, fittings and more. You will need your own tools, a good drill will definatley come in handy and save you lots of time. With the walls made with Tongue & Groove edges they're pretty easy to put together. You do get a set of paper instructions which are very detailed with pictures, diagrams and step by step guides to help you. With three adults we took around two hours to put our playhouse together but it was raining quite badly so that may have slowed us down a little but we were desperate to get it all ready for when the kids returned. I was so excited to see their little faces light up. On the day they came home I sent them out into the garden to put the recycling out. Waiting in the kitchen for their response I could hear them screaming, they were so excited! 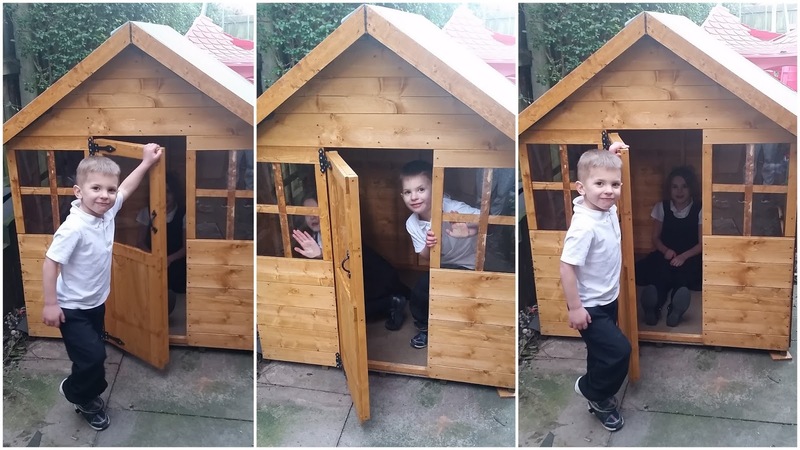 MY little man was over the moon, his very own house - he kept saying. He looked so happy. He has let his big sister in since but he's still calling it his house. Even though the weather has still been typically cold and rainy, that hasn't stopped them from enjoying their new playhouse. They've not had a day away from it yet. Both Lily and Ryan can't wait for the Summer when they can play it all day long. They're always disappearing off out into it with their toys, I think I'm going to have to put a nice hard wearing carpet or rug in there for them. Summer is going to be so nice this year now that the kids have a nice outdoors space of their own. A dry, Mummy free zone where they can play safely and have fun without me. I would happily recommend Garden Buildings Direct for anyone looking to buy a playhouse, garden shed or even adult summer house as their products are lovely and their customer service is just fantastic. They really care about their customers and can't do enough. Disclosure: We received our playhouse in return for an honest review.